Union Public Service Commission has released exam calendar of Year 2018-19. 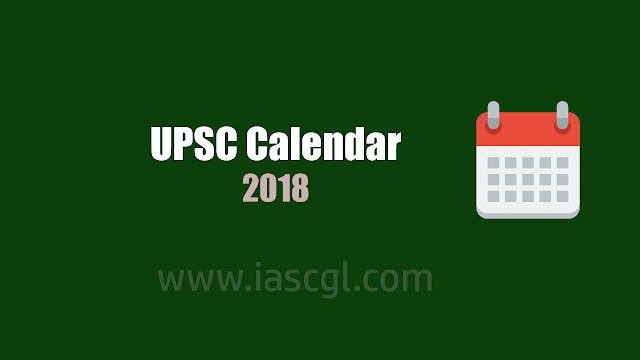 UPSC every year issue a exam calendar of its scheduled exams over the year. This will help candidate to monitor their prepartion according to time remain as well as details of all exam conducted by UPSC. This year UPSC conduct CSE Prelims exam on 3rd June 2018, Notification of UPSC Prelims exam to be release on February 7,2018. ** Civil Services (Main) Examination, 2018 will commence on 28.09.2018 in place of 01.10.2018. *** Date of Notification and Last Date for receipt of Applications of Combined Medical Services Examination, 2018 changed from 11.04.2018 to 02.05.2018 and 07.05.2018 to 25.05.2018 respectively. @ Last Date for receipt of Applications of C.D.S. Examination (II), 2018 changed from 03.09.2018 to 04.09.2018.